Download the EBook for only $9.99! Trying to plan for a living space for you or a loved one is a big undertaking. Each situation will vary on the number of rooms in your mother in-law suite it will take to support you or a loved one. It takes good planning and research to end up with a good space that will meet the occupant’s specific needs. The complexity of the suite will be driven by the amount of support they will need. You might need a space for more than one person. You may need to design a space for full kitchen, bath room or rooms and bedroom or rooms. You may only need the space to be a place for private times without full support. 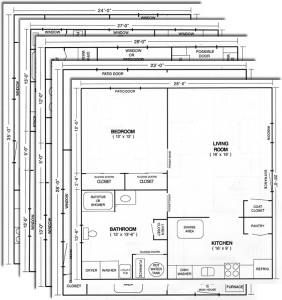 I offer these floor plans as building blocks. 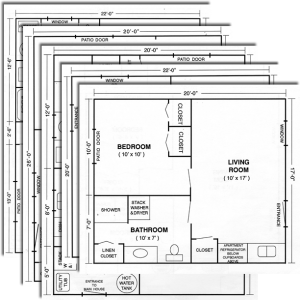 You can take these plans and change the dimension and move things around to fit your available space. I put together ten drawings that will help you see how much square footage is needed to meet the difference in support that I mentioned earlier. It includes plans that can be used for a garage conversion, a basement conversion or a suite addition. Some of the plans may be used for more than one conversion type. For instance, some of the plans with larger living room space could give room for an ascending stair case and use the plan for a basement conversion. Some have full functioning kitchen and some have a limited eat in kitchenette. You might need two bedrooms in the suite. I have included a suite with an additional bedroom/den. If your loved one is in need of or will need 24/7 care giver the space is there to accommodate that specific need. I want you to always remember egress for bedrooms. If you have a bedroom you will need a door or window large enough to meet egress codes. This is very important for two reasons. One is to ensure safety. The other is to allow you to be able to add the in-law suite to your existing living space when you are ready to sell your home. Another way to recoup the most cost of the in-law suite at the time of sale is to use Universal Design as you layout your plan. Universal Design means that your design will allow the most usable space for anyone who plans to live there. You design it with plenty of room for turning radius in the bathroom also in the kitchen, widen door openings and hallways to be wheelchair compliant even if your loved one is ambulatory. When you decide to sell your will have broaden the base of would be buyers. 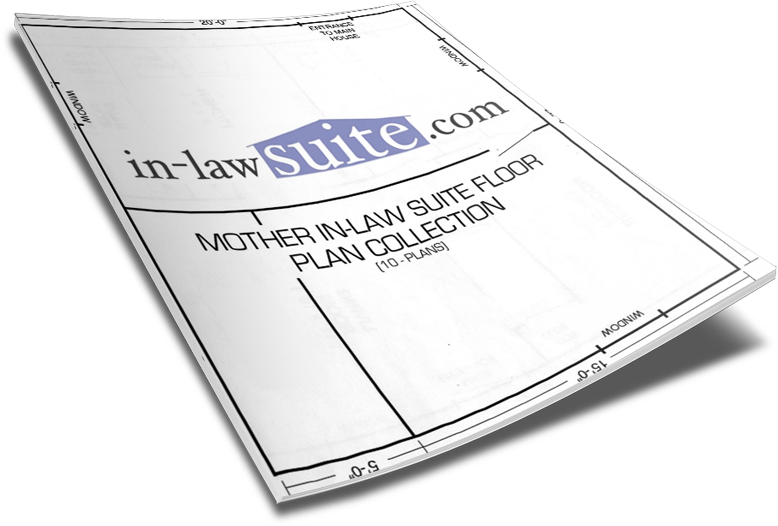 Download Our exclusive collection of Mother In-law Suite Floor plans Today! 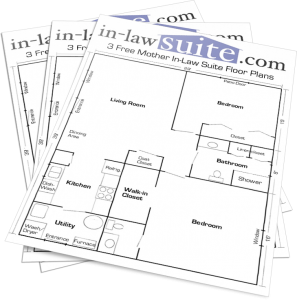 Here at in-lawsuite.com we are dedicated to providing you with helpful resources to equip you to better care for your aging loved ones in the comfort and safety of your own home. We are happy to introduce our special collection of 10 carefully selected mother in law suite floor plans to help you find just the right fit for your needs.